CHD7 mutations are implicated in a majority of cases of the congenital disorder, CHARGE syndrome. CHARGE, an autosomal dominant syndrome, is known to affect multiple tissues including eye, heart, ear, craniofacial nerves and skeleton and genital organs. Using a morpholino-antisense-oligonucleotide-based zebrafish model for CHARGE syndrome, we uncover a complex spectrum of abnormalities in the neural crest and the crest-derived cell types. We report for the first time, defects in myelinating Schwann cells, enteric neurons and pigment cells in a CHARGE model. We also observe defects in specification of peripheral neurons and craniofacial skeleton as previously reported. Chd7 morphants have impaired migration of neural crest cells and deregulation of sox10 expression from the early stages. Knocking down sox10 in the zebrafish CHARGE model rescued the defects in Schwann cells and craniofacial cartilage. Our zebrafish CHARGE model thus reveals important regulatory roles for Chd7 at multiple points of neural crest development viz., migration, fate choice and differentiation and we suggest that sox10 deregulation is an important driver of the neural crest-derived aspects of chd7 dependent CHARGE syndrome. 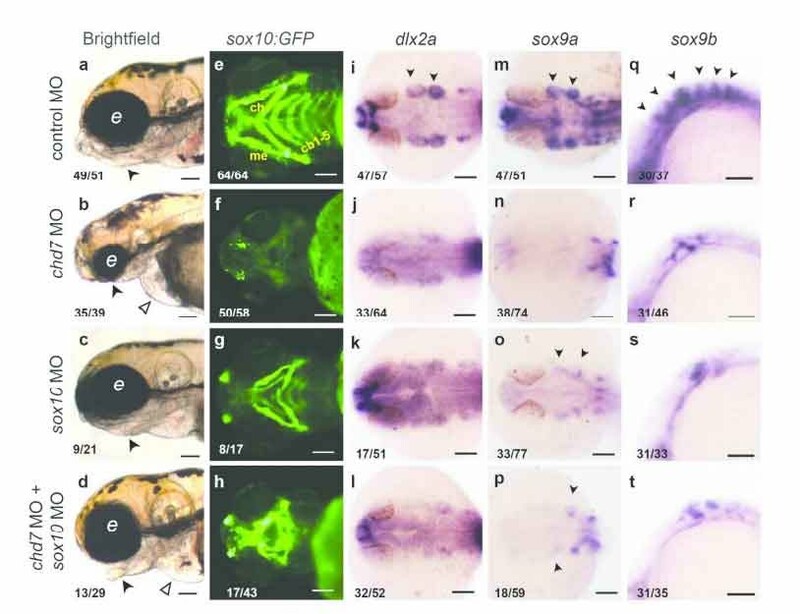 Asad Z, Pandey A, Babu A, Sun Y, Shevade K, Kapoor S, Ullah I, Ranjan S, Scaria V, Bajpai R, Sachidanandan C.
Rescue of neural crest derived phenotypes in a zebrafish CHARGE model by sox10 downregulation. If you are a Clinician and you think your patients would benefit from our Science, please join our collaborative effort GUaRDIAN, one of the largest clinical research networks for research in India working on Rare Genetic Diseases.